ReflectSoftware is pleased to announce the availability of our next release of ReflectInsight. Bug fixes and improvements to the Viewer. We’ve added support for the Log4net appender. This allows you to leverage your current investment in log4net, but leverage the power and flexibility that comes with the ReflectInsight viewer. You can view your log4net messages in real-time, in a rich viewer that allows you to filter out and search for what really matters to you. The log4net extension supports Log4net v1.2.11.0. However if you need to support an older version, then you will need to download the ReflectInsight Logging Extensions Library from CodePlex. You can then reference and rebuild the extension against a specific release of the log4net DLL. 1. Download the ReflectInsight Extension Binaries or Source and rebuild if necessary. 2. Once you have the ReflectInsight Extensions, go to your project in Visual Studio and add a reference to ReflectSoftware.Insight.Extensions.Log4net.dll. We’ve created a NuGet package for our Log4net extension. You can find it over on Nuget. To install ReflectSoftware.Insight.Extensions.Log4net extension, run the following command in the Package Manager Console. Feedback on our Insight Extensions or the ReflectInsight Viewer can be done on our UserVoice site. The ReflectInsight Viewer can be download from here. 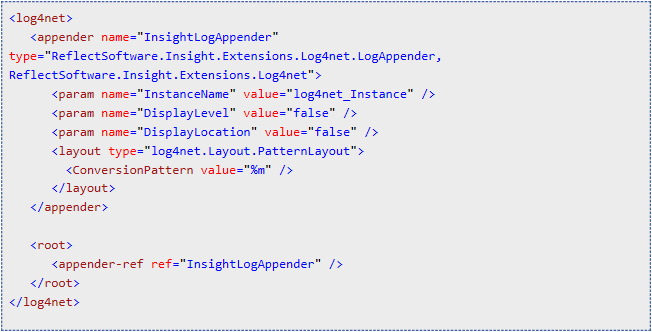 The ReflectInsight Logging Extensions are now available as NuGet packages. This is the easiest way to add the extensions to your project and keep them updated when more recent versions are available. 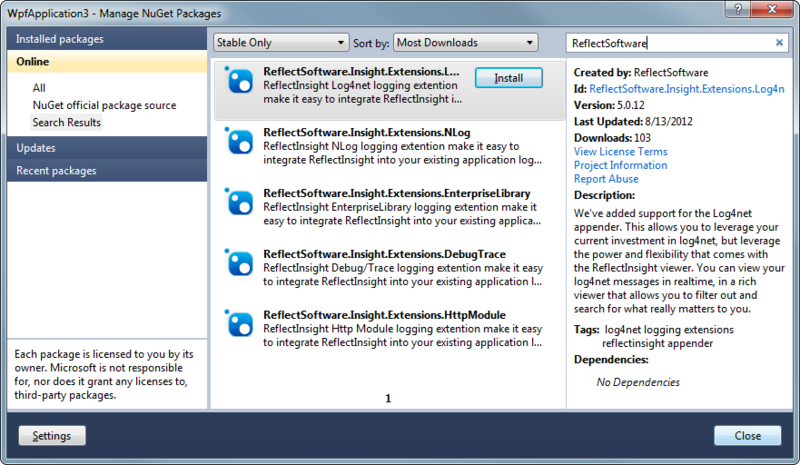 The ReflectInsight Extensions are not released as part of ReflectInsight, but are instead released through Microsoft’s NuGet distribution feature. NuGet allows you to add references to your projects by pulling in the relevant DLL’s directly into your project from the web. This really makes it easy to incorporate the extensions and keep them updated. In Visual Studio 2010 onwards there is a Visual Studio Extension called the Library Package Manager which provides an easy way to browse and install the appropriate assembly from the web into your projects. If your using Visual Studio 2005/2008, we recommend you download the source and/or binaries from the CodePlex site and add the references the usual way. To find the ReflectInsight Extensions on NuGet, right click on your project and click on the Manage NuGet Packages menu item. This will then bring up the Manage NuGet Extensions dialog as shown below. Search for ReflectSoftware and you will see all the available extensions. Documentation for the ReflectInsight Extensions, along with complete code samples is available on InsightExtensions CodePlex Site. The ReflectInsight Extensions source code repository is hosted on CodePlex. This will enable everyone in the community to be able to engage and provide feedback on the latest code checkins, bug fixes, and new feature enhancements. Community contributions are welcomed and encouraged so that we may build ReflectInsight Extensions into an even better product. More information can be found on the InsightExtensions CodePlex Site.